Remanufactured Life Fitness 95Ti Treadmill - Remanufactured fitness equipment offers the most cost effective GSA purchase solution for government and military spending budgets. 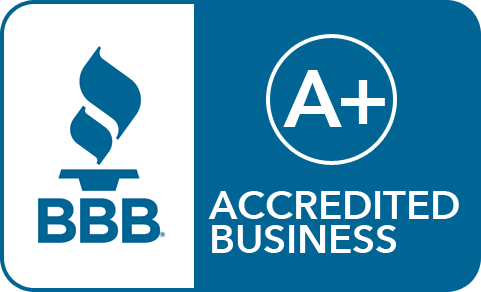 Purchase of certified and tested refurbished commercial cardio equipment will save you hundreds if not thousands of dollars over purchasing new, allowing your base or facility additional fiscal year-end funds to spend towards other fitness equipment. Choose from dozens of treadmills, upright cycles, recumbent exercise bikes, steppers, stepmills, and elliptical cross-trainers from top club brands such as Life Fitness, Precor, Cybex, Star Trac, Tectrix, and StairMaster. Many remanufactured cardio machines are priced with shipping included to fall within Government Purchase Card (GPC) spending allowance limits. All remanufactured products offered by Ironcompany.com® were originally manufactured in the United States, qualifying them for GSA open market purchase under the Buy American Act. As a preferred GSA-contracted supplier, Ironcompany.com® has been providing quality remanufactured exercise equipment Made in the USA to US Government and military facilities around the world for years. Equipment performance you can trust at the price you can afford! Life Fitness Remanufactured 95Ti Treadmill - Life Fitness treadmills are built with comfort and ease of use in mind. The 95Ti treadmill offers an intuitive console, extensive workout variety and Lifepulse heart rate hand sensors. 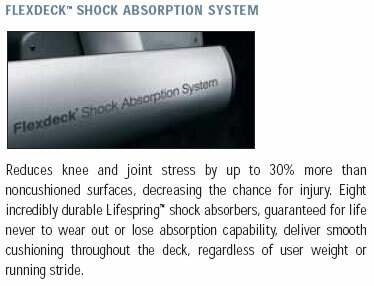 Standard features include 4.0 HP AC motor, the patented FlexDeck shock absorption system and Advanced Belt Tracking System technology for long belt life. With a cutting-edge industrial design and high-performing durability, nothing else compares to Life Fitness treadmills. Refurbished equipment is only as good as the refurbisher! This groundbreaking system combines a lubricant-infused belt, Advanced Belt Tracking System (ABTS) and our patented FlexDeck Shock Absorption System for the ultimate in durability and comfort. Lifepulse digital heart rate monitoring hand sensors are conveniently placed on the easy-to-go grip Ergo bar to provide walkers with precise heart rate monitoring. The Polar telemetry provides runners with accurate "hands-free" heart rate monitoring. Zone Training+ workouts automatically adjust the incline level to keep users in their target heart rate zone. Other workouts include 5K and 10K run, goal-based workouts, and Gerkin, Fit Test and Military PRT/PFT fitness protocals. An intuitive console makes startup simple and integrated cup holders and center CD/MP3 player holder provide comfort and convenience. Maintenance is fast and easy with the Auto Alert diagnostics that inform you of service needs and permanently record and date stamp maintenance records. A beautiful console that displays elapsed time, speed, distance, incline, calories burned, calories per hour, heart rate and distance climbed. Dimensions (L x W x H): 83" x 37" 63.5"
Weight of machine: 431 lbs. We utilize the latest technology and the #1 remanufacturer of used fitness equipment. But we just want you to know that any plastic pieces, plastic coverings, or shroud coverings may have minor scratches as the equipment is not brand new. These plastic pieces are only replaced if they are broken. Don't worry, as your new refurbished cardio machine is restored to factory specifications and will bring you years of enjoyment and save you tons of money off new prices! Choosing a Serviced machine over a Refurbished machine is a great way to get an even better deal on a commercial machine. However realize that these "Serviced" machines are not gone through with a fine tooth comb like the "Refurbished" option. In other words, your serviced machine is removed from the club that purchased it as new, cleaned up and then resold. All serviced machines leave our warehouse in perfect working condition and carry a 90-day warranty on parts. Limited Warranty. Ironcompany.com hereby provides Customer a six-month warranty on parts and labor, and a one-year warranty on motors; the warranty shall commence on the date Ironcompany.com ships the Equipment to Customer. This limited warranty does not cover normal wear and tear of the Equipment. Warranty is valid within the United States only. "Normal wear" parts are also the responsibility of the customer. Warranty excludes normal wear parts, such as belts, wax, etc., and normal wear parts are susceptible to Regular Routine Maintenance. Proof of maintenance during the warranty period is required. All equipment must be regularly maintained by a certified technician during warranty period. Cardio equipment runs on different types of voltages and amperages. Some products, i.e. treadmills, require a dedicated circuit. Batteries are excluded from warranties. It is the customers responsibility to make sure the proper voltages and amperages are used for proper operation. If in question, please contact us. EXTENDED WARRANTY available. 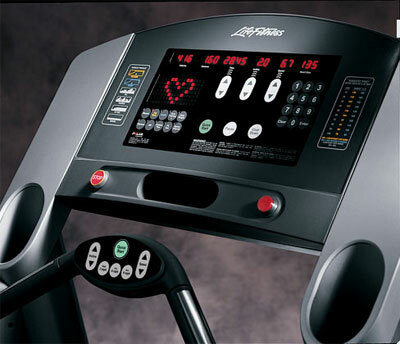 Click here to view Extended Warranty options for this remanufactured cardio machine. 110 VOLT 20 AMP dedicated circuit minimum with NEMA 5 plug. Dedicated circuits for each treadmill must be installed in accordance with current voltage drop standards set by NEC code. Note: A dedicated circuit is a circuit and breaker reserved for the exclusive use of one and ONLY one treadmill. This includes hot, neutral and ground wires. This circuit should not be shared with any other equipment. Looking to make a bulk purchase of refurbished treadmills for your fitness studio? Contact an Ironcompany.com fitness equipment specialist today at 1-888-758-7527 or email quotes@ironcompany.com. Due to the size and/or weight of this product, this item does not include shipping. If you place an order for this item the shipping cost will be emailed to you within 24 hours and will be an additional charge. We do our best to assure you the lowest possible shipping cost available. If you would like to obtain a quote for this product or multiple products before you order please email us at Quotes@ironcompany.com for a shipping quote request and include the product(s) Manufacturer, Name, and Part Number along with the ship to address. We do our best to assure the lowest shipping cost available. Will-call pickup is available at multiple locations across the country. To find out if you are near a remanufacturer supplier warehouse or if you would like more information about will-call options, please contact an Ironcompany.com fitness equipment specialist today at 1-888-758-7527 or email quotes@ironcompany.com. Will-call packing and preparation service fee may apply. Click here for information about refurbished equipment supplier location in California.